“Up until now, the 4th Moon has been the Moon of Ganesha to access his energy and blessings.Two weeks ago, Agastiya revealed to me through a very special Nadi Nigandu reading that it is the 14th Moon that is more important. Agastiya advised that worshiping Ganesha with Dhurva grass will do a world of good, particularly to accomplish your financial, relationship, health and spiritual goals. Dhurva grass was created by Shiva even before human beings were created. The grass actually facilitated the conversion of the heat energy of Parvati, which is a creative energy. Dhurva grass facilitates creation, particularly when you give it to Ganesha on the 14th Moon. Note: As this is an evergreen service, your Name will be added for the upcoming 14th Waning Moon rituals. Participate in the Essential Remedy Package of 14th Waning Moon or Chaturdasi. Dr. Pillai has recently come across new revelations about Ganesha from a very respectable, secret resource. It is from the great saint Agastya and it makes Ganesha even more accessible and endearing. Ganesha, the God who removes obstacles and gives success when propitiated with special offerings. Included in the Essential Remedy Package: AstroVed will perform the remedy of light and sound offering (Archana) and Durva grass garland in your name to Ganesha at his powerspot. So be a part of this important ritual that would turn into an effective tool to solve deep seated problems of your life on this effective day. Solve problems like finance problems, relationship problems, health problems, or whatever problems you have and thought them to be inaccessible. You will receive sacred grey ash powder and Kum-Kum (Red Vermillion Powder), which was blessed in the remedy. Keep this on your meditation altar and wear on your forehead during meditation or other times and expand the Divine blessings into your life. Please Note:Your prasad will be shipped from Chennai, Tamil Nadu. Please allow 2 – 4 weeks for delivery after the whole remedy are performed. Participate in the Enhanced Remedy Package of 14th Waning Moon or Chaturdasi. 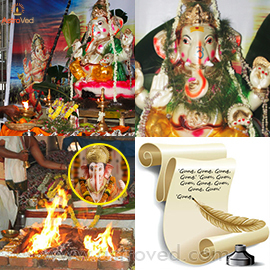 The is an effective day for worshipping Ganesha with garlands of Durva grass, also known as Ganesha grass. Included in the Enhanced Remedy Package: AstroVed will perform remedy of light and sound offering and Durva grass garland in your name to Ganesha at his powerspot. So be a part of this important ritual that would turn into an effective tool to solve deep seated problems of your life on this effective day. 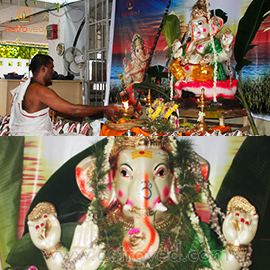 A group Maha Ganapathi Fire lab will be performed on 14th Moon in which 108 Durva grass will be offered into the fire. The remedy will do a lot of good which you have never experienced, particularly, to solve impossible problems, like finance problems, relationship problems, health problems, whatever problems you have. You will receive sacred grey ash powder and kum-kum (Red Vermillion Powder), which will be blessed in the rituals. Keep this on your meditation altar and wear it on your forehead during meditation or other times to expand the Divine blessings into your life. Participate in the Elite Remedy Package of 14th Waning Moon or Chaturdasi. AstroVed will perform the remedy of light and sound offering (Archana) and Durva grass garland in your name to Ganesha at his powerspot. So be a part of this important ritual that would turn into an effective tool to solve deep seated problems of your life on this effective day. 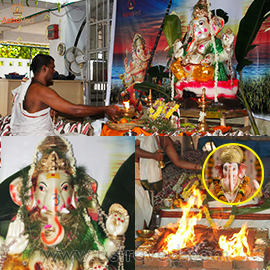 A group Maha Ganapathi Fire lab will be performed on 14th Moon in which 108 Durva grass will be offered into the fire. An individual Maha Ganapathi Fire lab for individuals with seed-mantra chanting will also be performed on this day. Writing the mantra – ‘Gung, Gung, Gung, Gung.’ ‘Gum, Gum, Gum, Gung, Gum, Gung, Gum 10008 times will help you receive blessings of Ganesha and support you by creating good vibrations. The remedy will do a lot of good which you have never experienced, particularly, to solve impossible problems, like finance problems, relationship problems, health problems, whatever problems you have.